My highlight reel for the last three days is extraordinary. The top of the page, you can see me running through the snow the day before yesterday. This is in Logie, a tiny hamlet, with snow in early spring. Fantastically beautiful, and my friend persuaded me to go for a half marathon distance in it. We ran from home to St Andrews, via the scenic - very very scenic - route. It was wonderful, though the last few miles through hail and biting wind off the North Sea took some working together to get through. mantle, outer core, inner core. Yesterday, I thought I was polishing off the very last changes to a paper which I've been working hard on after it was originally rejected. It has got much much better. Then I was driving home and suddenly realised how I could dramatically improve it with an elegant, simple, and I think important result. Admittedly this was frustrating: so close to submission and now some extra work. But I knew it was good news. I did another run in the snow, only 10k this time, and had another brilliant idea. Rang up my colleague who instantly persuaded me it was nonsense, but at least that idea won't mean extra work, so that's good too! And finally, over all those three days, my daughter and wife have been making and baking and icing this wonderful model of the earth in the form of cake. 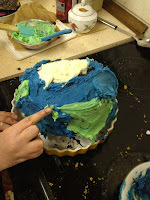 My daughter had to make a model of the earth for geography. But she and my wife have really done the topic proud, with a detailed cake containing all the key features, all in delicious eatable form. It looks fabulous, it tastes fabulous. Luckily the class is going to get to share it - I durst not estimate the number of calories in it! All these three things, Sunday, Monday, Tuesday, are worthy of a place in my highlight reel and I may well remember each of them clearly for the rest of my life. This evening I have been so miserable. Not able to cope, making my wife do everything. Not sharing in the joy of the cake. Not being able to get on with my paper consistently because my concentration wasn't there. Writing this post has helped. At this precise minute I'm not miserable.